Holiday home De Kroft is located in the centre of Noordwijk aan Zee, within 150m of the beach. This luxury accommodation can be booked for a group of up to 20 guests, or in 3 separate units, consisting of a 7-person and 11-person holiday home and a 2-person studio. Perfect for all sorts of holidays. The 3 different parts of the accommodation each have their own entrance. The 11-person holiday home and the studio are interconnected. De Kroft is the oldest farmhouse in Noordwijk aan Zee. Certain parts of the stables date back to the 17th century and the living spaces are even older than that. In those days, the coastal area was characterised by a few farms scattered across the dunes. Only two of those old farms remain, and De Kroft is one of those two. The holiday home got its name from the Dutch word for a stream with clear dune water. Some interesting details remind of its former farm function, like the characteristic semicircle windows and the statue of a farmer in front of the house. The farm has been completely renovated, turning it into a spacious, bright holiday home equipped with all modern comforts. The lovely interior is a nice finishing touch. The large table is perfect for everybody to gather around and eat or play a boardgame. The location of the house is ideal. Despite its central location, this place is an oasis of tranquillity. 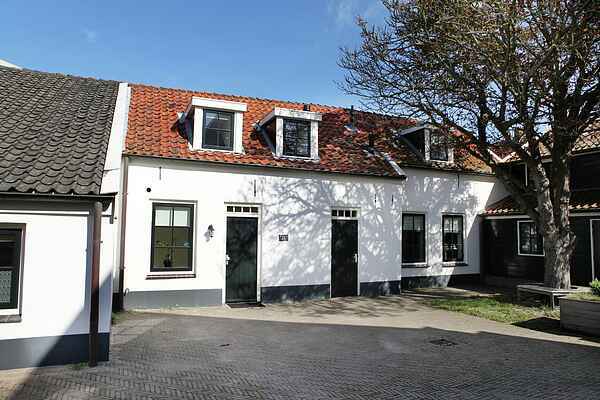 The former farmhouse is only one street away from the lively promenade and well-known Huis ter Duin. Everything is nearby, from bike rental to bakery with delicious sandwiches. The shopping centre is also within walking distance. The fashionable Noordwijk with its cosy boulevard is pleasantly crowded in the summer, but the coast of South Holland is recommended throughout the year. It's a great area for cycling tours. The surrounding cities of The Hague, Leiden, Amsterdam and Haarlem are also worth a visit. Or enjoy the Keukenhof gardens filled with flowers. Groups of young people are not allowed in this holiday home. Note: there's one open sleeping area with a bunk bed on the landing.